Completed in 2016, Villa Melo offers amazing views, jungle surroundings, privacy and tranquility in the hills of Chaweng Noi. It comprises of 3 bedrooms, a private infinitiy pool and a gym. Completed in 2016, Villa Melo offers amazing views, jungle surroundings, privacy and tranquility in the hills of Chaweng Noi. Yet beautiful beaches, a great variety of restaurants and lovely shops are only minutes away. 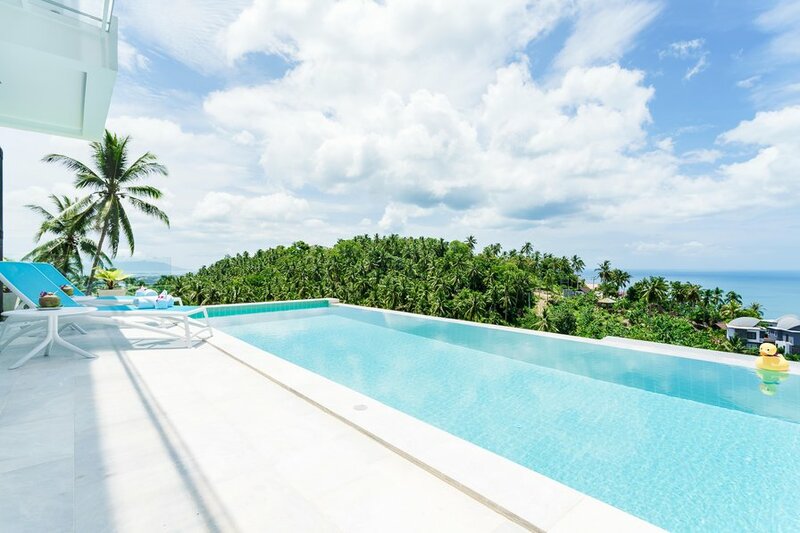 Enjoy the benefits of Villa Melo's elevated location when you relax on it's sunrise facing terrace with a pleasent summer breeze chilling your skin or take a swim in the huge infinity pool! A stairway takes you from the parking area to the entrance level of the villa, which comprises of the living room, the kitchen, a bedroom and a bathroom. Folding doors allow you to open the whole front of the living area, that connects to the terrace and the 30sqm infinity pool. Upstairs there are two more bedrooms with en-suite bathrooms and balconies. The private gym is located under the pool and is shared with the lower Villa Melo. Super fast fiber internet enables you to stay in touch with your loved ones at home and the well-equipped gym prevents you from missing your workout during your holiday. At any time the modern kitchen offers you the opportunity to cook your favorite dishes. On request and for a fee food can be prepared in the villa for you. The main road is 2 km away, so I highly recommend to rent a motorbike or a car. Of course I can arrange a rental vehicle for you or assist you in getting one on the island yourself. Daily prices on Samui start at 150 THB for a scooter and 700 THB for small cars. Bed linen, towels, shampoo and soap are provided. For longer stays, cleaning twice a week is included in the price. For a minimum stay of 3 nights, the pick up from the airport is provided without charge. With a minimum stay of one week the way back to the airport is free as well. Otherwise, you should expect an average price of 800 THB per trip. I live in an apartment below the lower Villa Melo myself and I wil do my best to ensure you are having a wonderful time on Koh Samui. I am happy to give you tips on what to discover on this beautiful island! For handicapped or elderly people the upper Villa Melo is not suitable due to it's access via a staircase.